Kybella is a non-invasive injectable procedure for adults who have moderate-to-severe fat deposits below the chin area. Dr. Douglas Steinbrech specializes in Kybella treatment for his patients in Los Angeles and Beverly Hills, CA. He is proud to offer the newly FDA approved, a non-surgical injectable treatment to eliminate double chin fat with Kybella in his office in Los Angeles. To request your consultation to treat double chin with Kybella, please use the contact form or call 310-570-2402. His office is conveniently located near 436 N Bedford Dr, Beverly Hills, CA 90210. 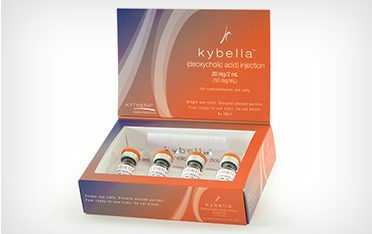 Kybella, also known as deoxycholic acid, is available in a non-invasive injectable procedure for adults who have moderate-to-severe fat deposits below the chin area. This type of fat is known as submental fat. Dr. Steinbrech is now able to treat his Los Angeles patients with Kybella and eliminate double chins without surgery. The whole process which takes 15 minutes is administered by Dr. Steinbrech with 10-20 injections of Kybella directly into the double chin fat area. The patient goes home the same day with minimal tenderness and mild to no scarring of any kind. The ideal Los Angeles candidate for the Kybella injection treatment would be males who have extra skin under the chin area. Kybella patients will lose the fat cells that are filling up the excess skin under the chin. Once the fat is dissolved, the ideal skin would be extremely elastic and resilient, allowing it to shrink appropriately after the procedure. If you’re ready to be free of the fat underneath your chin, contact Dr. Douglas Steinbrech today. Schedule your consultation at our Los Angeles office located near 436 N Bedford Drive, Beverly Hills to determine if Kybella could be helpful for you and your appearance. Call us today at 310-570-2402 to speak to our Patient Coordinator to learn more.